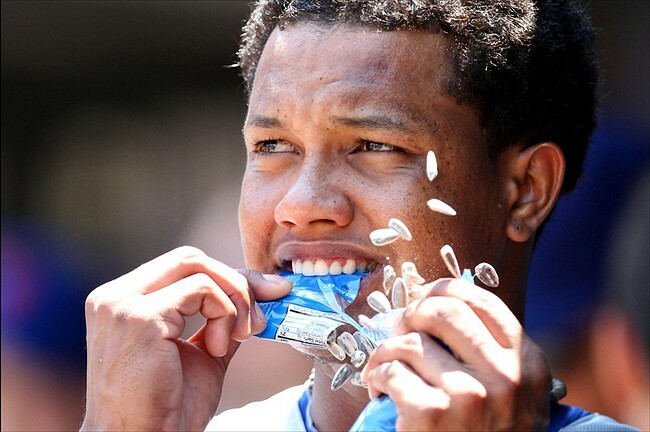 When is it time to bench Starlin Castro? I never thought that I would have to type that headline but unfortunately Starlin Castro has left me no choice. Before we can address the question at hand, first let’s take a look back at the five seasons that led up to this point. The love fest for Starlin began on May 7, 2010. He had been hitting .376 at Tennessee and was called up to the Big Leagues representing the only bright spot on a brutally bad Cubs team, and he arrived in epic fashion with 6 RBI including a home run. He was the sole reason I watched the Cubs that year and he finished the season hitting .300/.347/.408 in 125 games as a 20-year-old. To a bleary eyed Cubs fan who frantically grasp for the tiniest bit of hope, Starlin Castro represented the future of the Chicago Cubs, and a player who would eventually lead the team to the land of wins. It didn’t exactly turn out that way, but Starlin did his part for the first few seasons, putting up strong offensive numbers with some power and 20-plus steal speed on the bases. But then 2013 came along and Starlin put together his first truly disappointing season. In 161 games and 701 plate appearances that year Castro hit .245/.284/.347 with 10 home runs and saw his stole base total plummet from 25 the previous year to just nine. As a Kool-Aid drinking Cubs fan, I just tried to brush it off. His BABIP that year was low for him at .290 after being up at .346, .345 and .315 the previous three years, so in my mind it was just a bit of bad luck, which led to a lack of chances for stolen bases. After explaining away 2013 and seeing Castro’s near complete bounce back season in 2014, optimism was high again heading into this season, with fans hoping that Castro could take the next step as a hitter that most had been waiting for. Instead we have seen by far Castro’s worst season as a professional through the first 88 games. After a career high walk rate last year of 6.2 percent, Castro is down to a career worst rate this year at 4.1 percent. His power has also completely disappeared after hitting five home runs early in the year, Castro has managed to get his ISO into slap hitter territory at .072, by far his worst showing in the category that measures pure extra base power by subtracting batting average from slugging percentage. So Starlin is hitting a lot more balls on the ground and those balls simply aren’t finding holes. A lack of line drives has cut into Starlin’s extra base hit output and that has further been hurt by a lack of fly balls and a decreased home run per fly ball rate. As a 25-year-old this season, Cubs fans had hoped that Castro may start to develop more of a power stroke, but this late into the game, that power stroke we’ve been waiting for may simply never be a part of Starlin’s game. As he has aged he’s added more bulk, which has hurt his speed but also hasn’t helped his power output. The deeper we get into Starlin Castro’s career, the more he looks like just another guy, a slightly above average player at a premium position. While that’s not necessarily a bad thing, it’s also not what we had hoped for. He does not get on base due to a well below average walk rate, and if he’s not hitting line drives or getting lucky on ground balls, this is the end result. While the future for Starlin looks a little bleak right now, he still has time to continue to develop as a player. He will never be a guy that walks a lot, but there is still power waiting to be tapped in his bat and his contact skills have value. Clearly though, Starlin has to make adjustments to his game, whether it’s pitch selection or swing plane, or any other number of things that may only be corrected with good coaching and pure determination. The problem is that this Cubs team can’t wait for Castro to figure it out, neither in the short term nor the long term. If Javier Baez hadn’t gone down with an injury when he did, this may be a more pressing question, but the question remains. When is it time to bench Starlin Castro? Baez is still expected to be out for two to three more weeks according to his manager at Iowa and will then need to prove himself all over again before we could expect a call up. But a few possibilities still remain for replacing Castro in the lineup. Shifting Addison Russell to shortstop would be the first step, which would leave the Cubs searching for a second baseman. That could come in the form of Tommy La Stella who is similar to Castro in their high contact approaches, but differs by having less power but a much higher walk rate, routinely averaging in the double digits. La Stella had been on his way back to resuming baseball activities but re-injured himself in May and was expected to be out another month. There has been no report on when La Stella will be back however, so similarly to Baez, this conversation will have to be tabled. Given the injuries to the Cubs two most likely replacements for Castro in the lineup, the best way to replace him may come from a trade. Trading Castro himself is likely off the table as the Cubs would never want to sell this low on a player, but trading for a player like Ben Zobrist could be the answer. Zobrist hasn’t been having a great season but he would be an upgrade over Castro as his OPS of .768 dwarfs Castro’s OPS of .595 (wow that’s bad). The Cubs have been rumored to be interested in Zobrist since the beginning of the season due to his ability to play multiple positions and his familiarity with manager Joe Maddon after their six seasons together in Tampa Bay. Zobrist can play short, second or outfield and the idea of adding him continues to make a lot of sense. Zobrist is 34 and will be a free agent at the end of the season, so Billy Beane and the A’s really can’t demand a whole lot for him, but he would still cost the Cubs a decent prospect and Beane may hold out for more after his last deal with the Cubs (Addison Russell and Billy McKinney for Jeff Samardzija and Jason Hammel) didn’t exactly pan out. A trade could come at any time, but barring an acquisition, the next few weeks will be critical for Starlin Castro’s place on this current Cubs team, and potentially future Cubs teams. If Castro can’t turn around his season by the time Javier Baez or Tommy La Stella are healthy, he should get used to life on the bench, either in a platoon with La Stella or flat out pinch hitter status if Baez were to take off with the job. While we can’t give up on Starlin just yet, the deck is stacked heavily against him.